This kusudama is sold in a kit; I have no idea where to find a published book with it. Once again the name is 新フローラくす玉 or new floral kusudama and the author is 上田暁美/ UEDA Akemi. This kusudama is only doable with glue. Assembly is like a sonobe, a 30 unit sonobe. This is my recently folded kusudama and I think it is very cute. Assembly is better with double sided chiyogami or any kind of paper that has different patterns/ colours/ prints on each face. Since I had a bit of space and some paper I also added a small cube… The cube was assembled with 6 units. 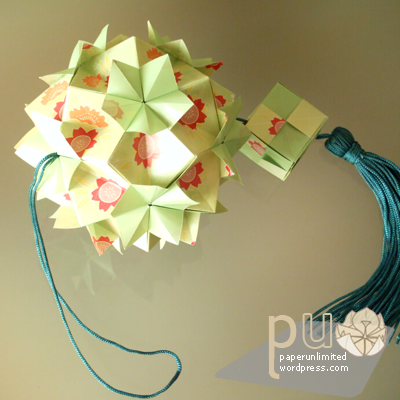 All units were made with 5x5cm (2×2″) paper; the kusudama ends with 9cm/ 3.5″ diameter. 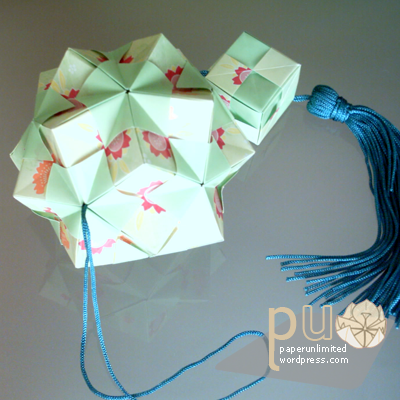 I better add that this kusudama is also known in some places and by some people as Spring kusudama (Hello Brazil! ehehe). This entry was posted on 2007|08|18 at 17:04 and is filed under kusudama, kusudama (glued), modular origami. You can follow any responses to this entry through the RSS 2.0 feed. You can leave a response, or trackback from your own site. How do u make this origami. looks like a 30 piece one. I love the tassels – i assume you hang them up? & The second one – wow :) it looks great! I would love to make one of them. Yes, the last one is known here in Brazil as Spring. I love it!